The Air Rifle / Air Pistol Ranges consist of three Ranges. 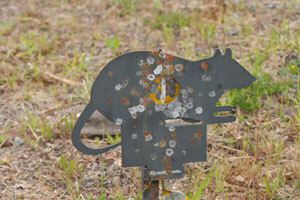 Range 1 is a short field target range, consisting of 10 drop and reset when shot animal targets. 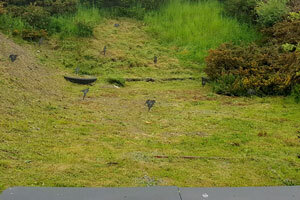 Range 2 is a medium range field target range, consisting of 10 drop and reset when shot animal targets, all hidden in foliage. 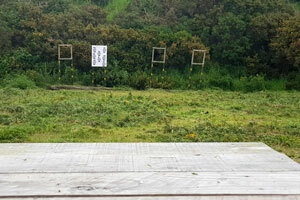 Range 3 is a standard target range of 20 yds consisting of 4 shooting points, target frames and shooting benches. We currently have two more ranges planned, these will consist of a longer field target range, and a 35yd standard target range, both will be equipped with benches. Everyone is welcome to use the Air Rifle and Airsoft Ranges, under 18’s must be accompanied by a responsible adult. Individuals, groups and parties welcome. Please call the shop for more information.